WRAP WEDNESDAY! 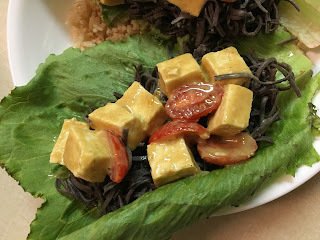 : Vegan "Honey" Mustard Tofu Lettuce Wraps with Black Bean Spaghetti. I don't know about you, but Wednesdays are usually pretty busy for me. Between work, classes, homework, and extracurriculars, I'm worn out by the time I get home in the evening! That said, a girl's still gotta eat dinner...no matter HOW hectic the day's been! 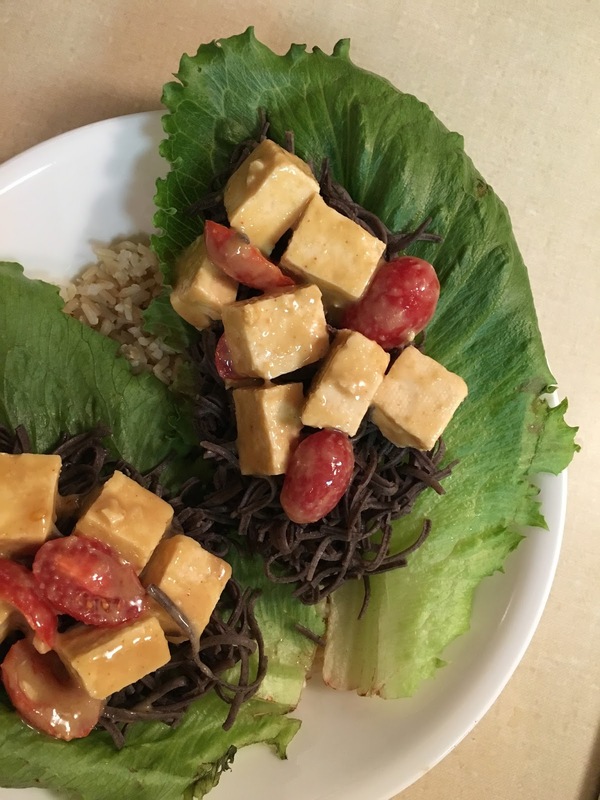 That's the best part about these Vegan "Honey" Mustard Tofu Lettuce Wraps with Black Bean Spaghetti...they're delicious, healthy, well-rounded and filling (packing a whopping 45 GRAMS of plant-based protein! )...and ready in a little over 10 minutes. SAY WHA?!?!?!? For real. Even better?! They both look AND taste good enough (and complicated enough!) to serve to your friends for a quick dinner party option. Without further ado, enjoy, guys! Vegan "Honey" Mustard Tofu Lettuce Wraps with Black Bean Spaghetti. 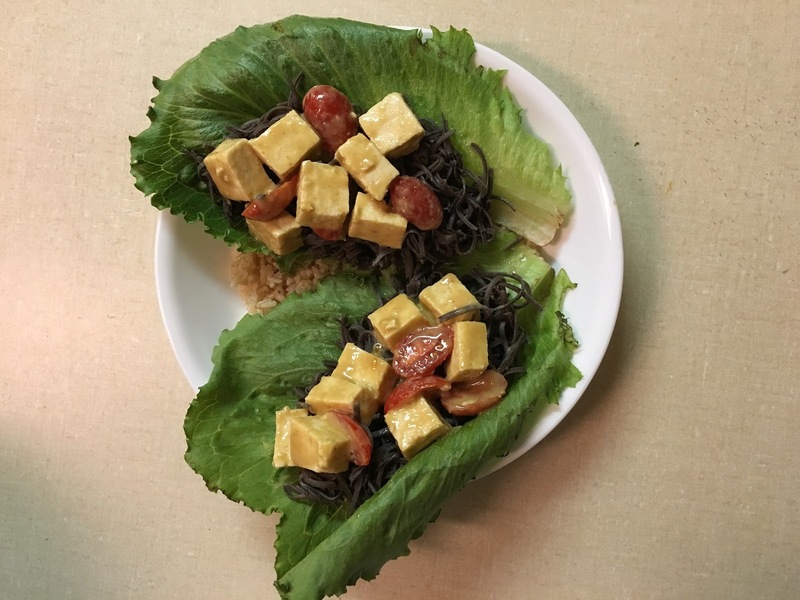 Vegan "Honey" Mustard Tofu Lettuce Wraps with Black Bean Spaghetti. Vegan, Gluten-free. Serves one. 1. Fill a small soup pot 3/4 full with water and bring to a boil. Add spaghetti noodles and let simmer 10 minutes. Drain water and set aside to cool. 2. Combine dijon mustard, "honey," spices, and soy sauce in a small/medium-sized bowl and whisk well. Add tofu cubes and toss to coat. Add sliced tomatoes and toss. 3. Fill lettuce leaves with black bean spaghetti and top with "honey" mustard tofu mixture. Serve over brown rice. 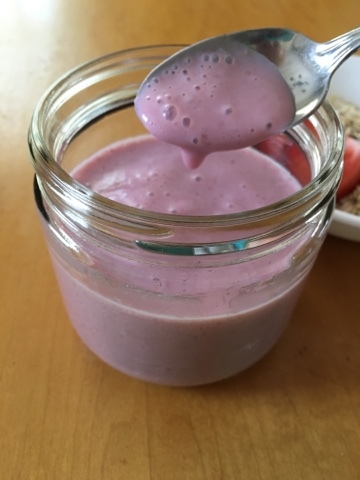 Today's recipe is a super easy and delicious quick breakfast or snack idea. Perfect make-ahead option for those post hot and sweaty run breakfasts (yes, yes, it's getting to be that time of year again!). Don't have strawbs on hand?! No problem. Any berries will work! (Even frozen! Banana would be awesome, too!) However you opt to enjoy this tasty treat, I know you'll love it! Enjoy and have a fabulous Friday, guys! 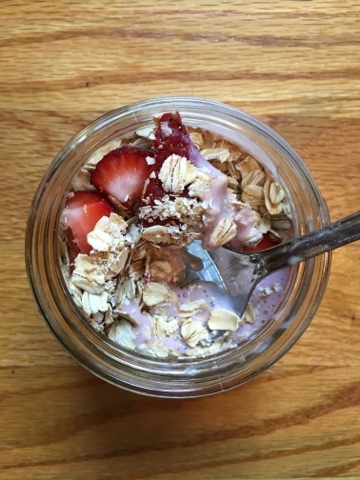 OatMuesli with Strawberry Mylk. Vegan, gluten-free. Serves one. 1. Combine oats and flaxseeds in a medium sized bowl and mix well. Set aside. 2. Combine strawberries, milk of choice, tofu, and sweetener ofnchoiceninnhighbspeed blender and blend from low to high speed unit perfectly smooth. 3. Store Mylk in an airtight container in fridge until ready to enjoy. Mix all ingredients before serving. Serve chilled for best taste. Have you ever been in a breakfast rut? Come on...y'all know what I'm talking about: cereal, oatmeal, tofu scramble, avo toast, repeat. The end. Boring, right? Yup, agreed. 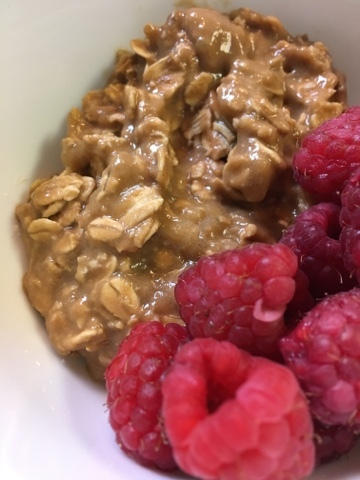 Sometimes you're tastebuds are just hankering for a change...and my Peanut Butter Banana Breakfast Cookie Dough delivers: not only is it packed with vitamins and healthy fats, but it literally tastes like you're eating dessert for breakfast. Even better?! : it takes about 3 minutes to make...IF THAT. Now if THAT doesn't make you wanna jump out of bed on Monday mornings, I don't know WHAT will...enjoy, guys! 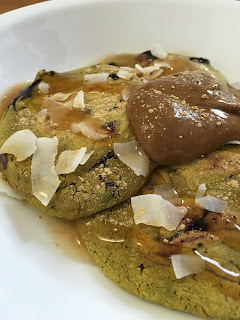 Peanut Butter Banana Breakfast Cookie Dough. Vegan, Gluten-free. Serves one. 1. Combine all ingredients in a medium sized mixing bowl and stir well. 2. Scoop cookie dough into a small serving bowl and top as desired. Serve! Exciting announcements! : Ebooks and Health Fairs! Happy Friday, fitties! So, I have some prrrreeeeeetttttyyyy exciting news...TWO things, actually. Number 1: THE EBOOK IS OFFICIALLY OUT! You can now purchase your very own copy of "The Fit Vegan Ginger's '(Almost) No-Cook Book'!" for $10. My very first recipe ebook features 70 pages of delicious, single-serving vegan recipes...all ready in 15 minutes OR LESS! To purchase, simply click on the "Cookbooks and Ebooks" tab on the top of my homepage and select The Fit Vegan Ginger's "(Almost) No-Cook Book!" Now for announcement number 2...are you in the Lynchburg, VA area this weekend?! Well, if so, you're in luck...I will be at the Health Fair at the Vitamin Shoppe in Lynchburg tomorrow, April 30, from 12-4 pm! I will have samples from my brand-new ebook, as well as a printed copy for you to browse through before purchasing! Be sure to stop by and say "hi" to me! I'd love to meet and chat...over some yummy snacks, of course (FOOD IS A MUST ALWAYS ALWAYS!). Pancake Sunday! : Turmeric Blueberry Spice Superfood Pancakes. If you're like me, Sundays mean a couple of things: 1. sleeping in. 2. rest day...aka extra time for yoga. 3. quality time with family and friends. 4. "catch up" and "prep for the week ahead" day. And 5. PANCAKES FOR BREAKFASTTTTTTT! It's pretty much the golden rule when it comes to Sunday breakfast or brunch: whatever you eat, your plate MUST include a short stack (or a tall stack...). Turmeric. Turmeric is probably the most potent herb out there when it comes to health benefits. Turmeric has powerful anti-inflammatory properties...it has been used as a natural alternative to prednisone in some case studies (with SUCCESS, I might add!). In addition, turmeric has powerful antioxidant properties, making it extremely effective at ridding the body of harmful free radicals. In other studies, turmeric has been shown to be effective at reducing the risk of heart disease, treating depression, lessening the effects of alzheimer's, and even curing cancer! Wild Blueberries. Wild blueberries are among nature's leading sources of antioxidant's. According to wildblueberries.com, "...a one-cup serving of Wild Blueberries has more total antioxidant capacity (TAC) than 20 other fruits and veggies, including cranberries, strawberries, plums, raspberries and even cultivated blueberries." Blueberries naturally contain the antioxidants pterostilbene and reservatrol, both of which are effective at neutralizing free radicals. 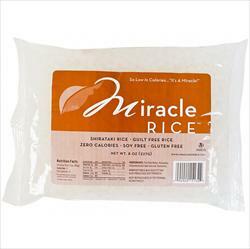 They are one of the best sources of natural fiber, containing a whopping 6.2 grams in just 1 cup. Additionally, blueberries contain health amounts of Vitamin K, Vitamin C, manganese, and copper. Coconut. Just one ounce of dried coconut contains 4 grams of fiber, making it a delicious way to help you "stay regular." Coconut also contains brain-boosting copper, which promotes the production of myelin, the protective coating around our brain's neurotransmitters. Studies also link coconut to improved memory. As you can see, these pancakes are pretty darn healthy. But that's not all...they're pretty darn delicious, too! But don't take my word for it....try 'em yourself! And let me know watcha think in the comments! Have a great week, guys, and enjoy your pancakes! Turmeric Blueberry Spice Superfood Pancakes. Turmeric Blueberry Spice Superfood Pancakes. Vegan, Gluten-free. Serves one (makes 5 medium-sized pancakes). 1. Combine first 5 ingredients in a medium-sized bowl and whisk well. Add blueberries and coconut milk and stir. until a smooth batter forms. 2. Pour about 1/4 cup of batter onto heated nonstick pan. Cook 3-4 minutes per side. Repeat with remaining batter. 3. Arrange pancakes on a large plate and add toppings. Serve immediately. You guys already know that I'm a pretty die-hard foodie...especially when it comes to holidays. One of my favorite things about holidays is making delicious vegan food: for myself, for my family, for my friends, and heck...for my puppy! (Candy cane dog biscuits are gonna be a thing in my household this Christmas...I'll share the recipe, don't worry! :) ) However, when said holiday happens to be a FOOD HOLIDAY like today (HELLOOOOOO #NATIONALGRILLEDCHEESEDAY! ), the little girl that still lives inside me screams even louder than she does on regular holidays. I mean, what's better than AN ENTIRE DAY DEDICATED TO ONE FOOD...especially when that food just so happens to be a GRILLED CHEESE SANDWICH. With that said, let's backtrack a little bit. I'm a huge food-holiday lover...including the WEEKLY food holidays: Meatless Monday, Waffle Wednesday, Pancake Sunday, and the star of today's recipe inspo: TACO TUESDAY. I was trying to think of a creative way to combine these two food holidays into one, and thus, it seemed I had two options. Option 1: taco grilled cheese. Think crispy bread slathered with homemade guac and stuffed to the brim with all my fave taco topping goodness. Tempting, but BORING. Everyone does that. 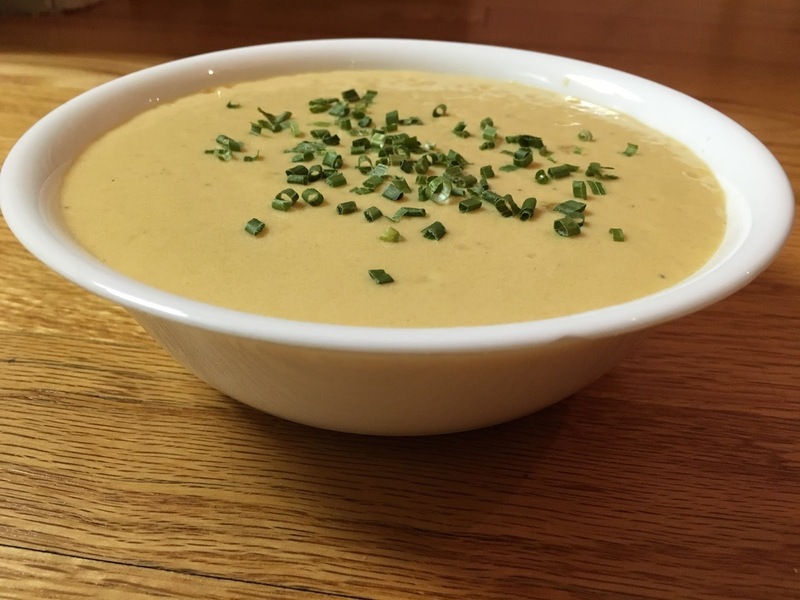 (Although this recipe looks pretty darn tasty when swapped with vegan "meat" and cheeze!) That brings us to option 2: Grilled cheese tacos. WHAT?! Uh-huh. My first thought was, "HOW?!" (This might have been your first thought too...!) I mean, think about it: a grilled cheese is delicious, gooey, melty cheese inside two slices of bread (duh...). How exactly can you turn that into tacos without just changing the shape of the grilled cheese sandwich?! Ah-ha...now we're getting somewhere! 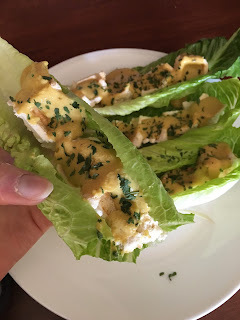 Behold, my friends, my original creation...the first recipe of it's kind, straight outta my crazy head: The Fit Vegan Ginger's Grilled Cheeze Tacos. 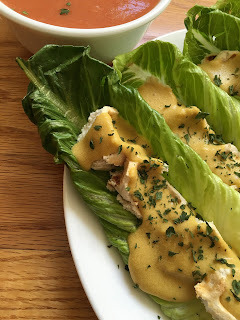 Delicious toasty bread cubes inside perfectly crispy romaine lettuce leaves and slathered in my sinlessly gooey and delicious cheeze sauce. And because a grilles cheese isn't complete without a bowl of tomato soup, I've included the recipe for my luscious Summery Tomato and Sweet Garlic Soup! This is such a unique and delicious spin on an old-time foodie fave, and it's a perfect meal for a warm spring day like today! 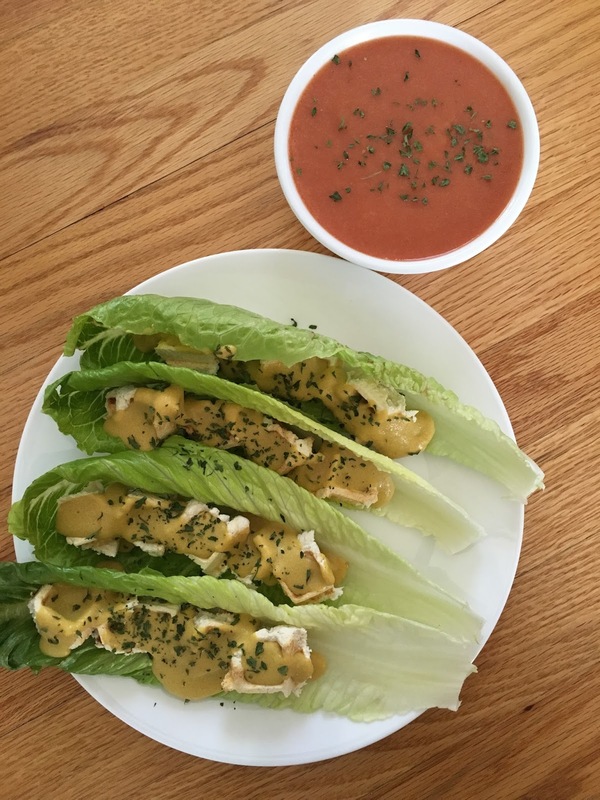 The lettuce "taco shells" in place of bread give it a nice and light feel, while the slightly sweet tomato garlic soup adds a nice palate cleanser to the richness of the cheeze. Convinced?! Mission accomplished. Enjoy, fitties! Grilled Cheeze Tacos and Summery Tomato and Sweet Garlic Soup. Crispy, crunchy, cheesy, healthy...all in one. So good. 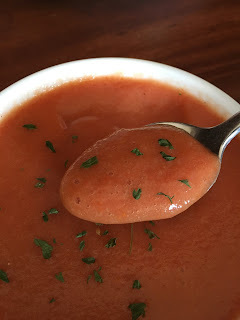 Summery Tomato and Sweet Garlic Soup. 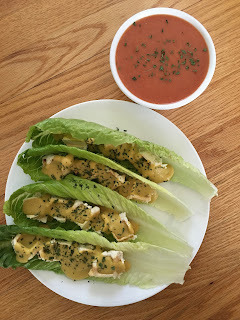 Grilled Cheeze Tacos with Summery Tomato and Sweet Garlic Soup. Vegan, Gluten-free. Serves one. 1. Preheat oven to 400 F and line a baking sheet with parchment. 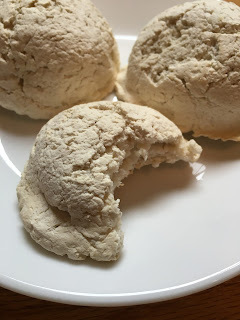 Place bread cubes on parchment (you cold spray with coconut oil cooking spray, if desired) and bake until crispy, about 15-25 minutes, flipping halfway through. 2. Remove bread cubes from oven and let cool 10 minutes. When cool enough to handle, fill lettuce leaves with bread cubes and set aside. 3. Combine all ingredients for soup in your vitamix or high-speed blender and blend until smooth, starting on low speed and working up to high. Pour into small bowl and chill until ready to serve. 4. Prepare cheeze sauce according to recipe instructions. Drizzle cheeze over tacos and sprinkle with parsley. Serve with chilled tomato soup and a side salad. 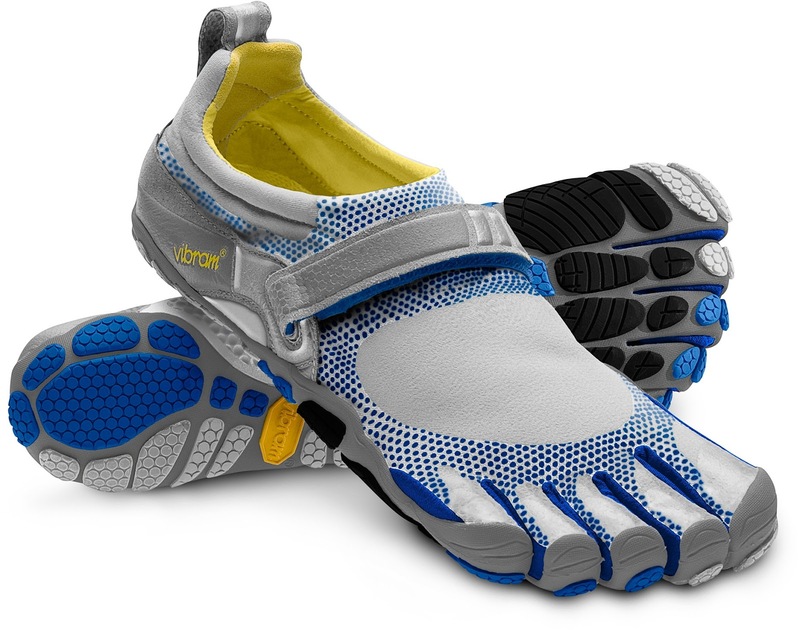 Workout Wednesday Poll: Should You Have Different Shoes for Different Types of Workouts? Today's WW post isn't a workout, but it's a common question in the fitness world these days: should you have multiple pairs of workout shoes if you do multiple types of exercise? I get asked this question so often...but there isn't one set answer. Just like one brand of running shoe isn't perfect for every runner, the same answer to this question may not be a good "fit" for everyone. So how can you know what YOUR answer is? Well, first we need to look at what types of exercise you do. For example, let's say you're primarily a runner, and also lift weights a couple times per week...do you need different shoes? Most likely not. Now switching gears, let's say you're a cardio queen (or king) that alternates between the elliptical, stair stepper, and treadmill, who occasionally throws in a cross-fit class. The verdict for you? Get a second pair. How can you know, though? What is your situation is different from either of these? 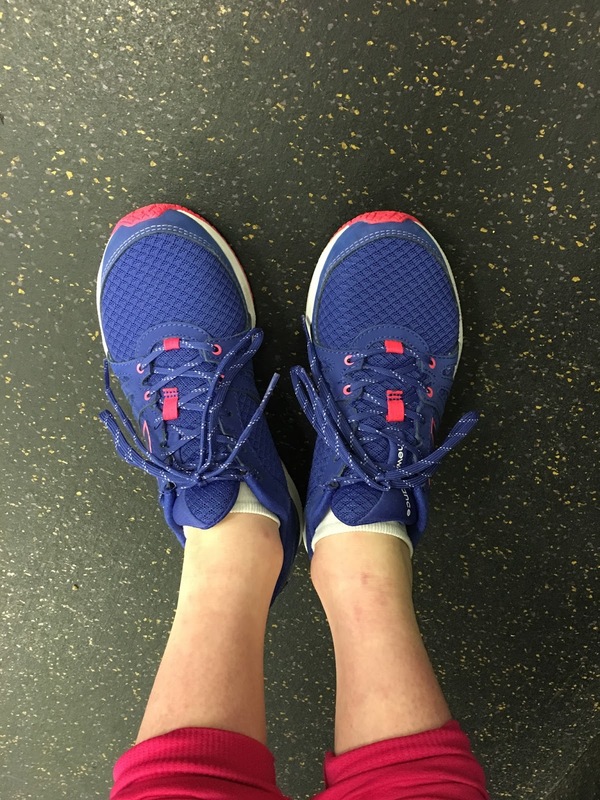 No problem...here's the bottom line and my rule of thumb when it comes to workout shoes: if both/all of your exercise routines are upright mileage based (think running, walking, hiking, even elliptical), definitely have 2 pairs. However, if your workouts are 1 type of primary cardio (i.e. 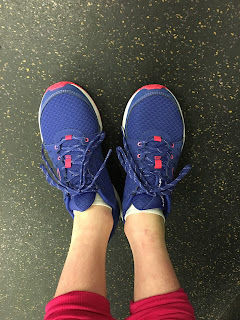 running) and 1 type primary strength training, then you don't necessarily need a second pair (unless you're simply a workout shoe junkie and can't seem to have enough sneakers...like me...hey--there are worse addictions!). In addition to having different shoes for different workouts, many running coaches even advise having two pairs of shoes that you alternate between on a regular basis--regardless of cross-training or alternate workouts, for the sole reason that each pair will last longer. You literally buy two pairs of the exact same shoe at the exact same time, and alternate between the two pairs (say, weekly). The more you switch up your shoes during your workout week, the more life you'll end up getting out of all of them. And, as mentioned above, this goes for more than just running. I'll use myself as an example: I run 5 days per week and cross-train on the elliptical once per week, in addition to lifting 3 times per week and HIIT 3 times per week. I have one pair of running shoes I wear for my runs and my lifting sessions, and one pair I wear for my XT and HIIT sessions. I've been doing this for a few years now, and have definitely noticed better life span in my shoes because of it. Now, if you're reading this and going, "Hold up now, Anna. ONE pair of running shoes is expensive enough...how will I buy TWO pairs all the time?!" My sentiments exactly...at the beginning. Remember how I said you can, in some cases, get DOUBLE THE LIFE out of your shoes when you alternate between two or more pairs on a regular basis?! Well, there's your solution: you're not spending any more money than you normally would be...LESS, even! Yes, it's more money up front, but you'll end up saving money in the long run. Now what kind of shoes do you need? Well, if you're a hard-core runner (or really a runner at all), you should without a doubt get fitted at least once for a good, solid pair of true running shoes. After I recovered from my stress fracture in 2012, I went to my local running store and got fitted for a really good pair of shoes, per my Physical Therapist's suggestion...and it was one of the best decisions I've ever made. 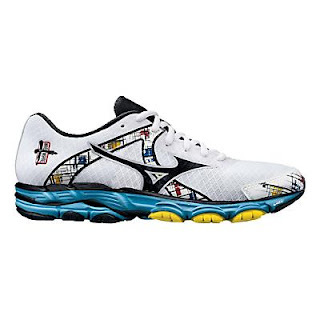 They matched me with my beloved Mizuno Wave Inspire running shoes, and I fell in love instantly! I'm now on my 6th pair of these babies...they're the only shoe I'll run in! My beloved Mizuno Wave Inspire running shoes...in the color I'm currently running in! As far as the cross training shoes go, you've got two options. Option 1: when you hit your mileage limit on a pair of your running shoes, simply switch them to your XT shoes. Option 2: buy a much cheaper pair of general workout/athletic shoes of your choice from a non-specialty (and thus, non-EXPENSIVE...think $70 or so) store for your alternate workouts. This one is not as thrifty as option 1, obviously, but your XT shoes can double as "fashionable athletic shoes" that you can wear around town (think grocery shopping!). I've done both of these options and have had good success with both. My current pair of "XT/alternate workout shoes": simply a pair of cute New Balances I got from a department store! In summary, it really doesn't matter which route you go...just make sure you're rotating your shoes in some way--feel free to come up with your own method and way of doing it...see what works for you! Just make sure you are, truly and diligently rotating your shoes. I cannot stress this enough. After one round of alternating your shoes, you will be amazed--6 months after you purchase the shoes, when you would normally have to fork out another $120-$150 bucks for another pair, your shoes will just barely be worn...and you'll be a believer for life! Think you wanna try my method? Let me know! Comment on the post, shoot me an email (my email can be found on my page, "Link up with TFVG! "), or send me a message on my Facebook page (Facebook.com/thefitveganginger). I'd love to connect and keep up with you on your new shoe experiment! 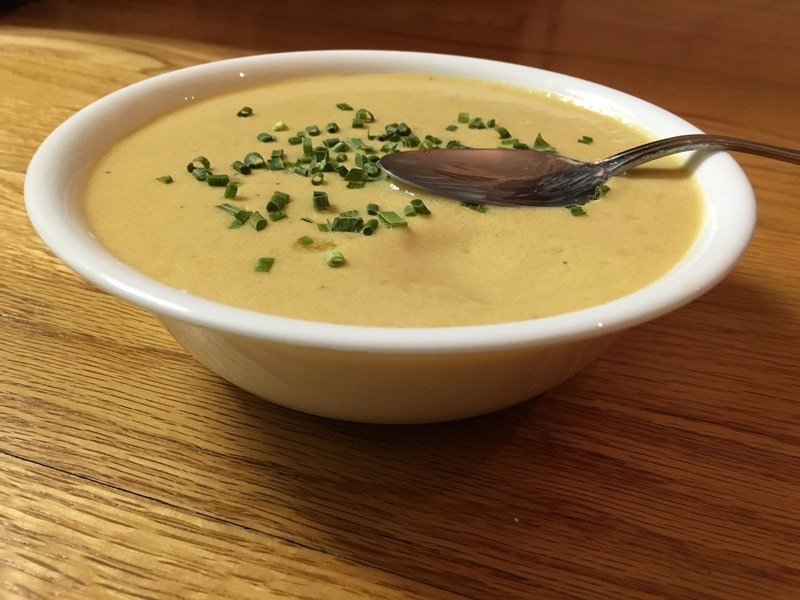 This White Cheddar Cheeze-Chive Soup is so simple to whip up and perfect for any time of year. Add some toast and seasonal veggies on the side, and you've got yourself a yummy dinner (or lunch! Yep, it's that fast to make!). Enjoy...and be sure to let me know what you think by posting your comments! :) I'd love to know what you served with your soup and how you liked it! White Cheddar Cheeze-Chive Soup. Vegan, Gluten-free. Serves one (can easily be doubled or tripled to serve additional people). 1. Peel sweet potato and combine in Vitamix or high speed blender with all ingredients except chives. Blend low to high until super smooth. 2. Pour into small soup pot and bring to a boil over high heat. Reduce to a simmer and cook 5-7 minutes. 3. Pour into a bowl and garnish with chives. Serve warm. I think we all have that one night per week when we simply just don't want to cook. Or at least, we don't want to spend a long time thinking about WHAT to cook. Maybe you have a weekly after-work activity, late afternoon study group that always ends later than you expect it will, or an impromptu mandatory staff meeting...whatever it is for you, it's making you not wanna cook. We've all been there. For me, that day of the week is Thursday. I have to be at work very early on Thursdays, and get off just in time to head to ballet, which don't end until 9:30. You can probably imagine that by the time I get home on Thursday nights, I'm ready to eat and go to bed! 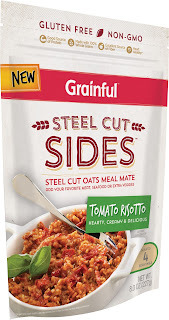 So what are my favorite quick, healthy go-to meals and meal ideas? This was super simple and quick, but so so good! I simply took a gluten-free, spinach wrap, filled it with fresh spinach (you could also do steamed), topped it with my Vegan Ricotta Cheeze for my cookbook, and added fresh Roma tomato slices. 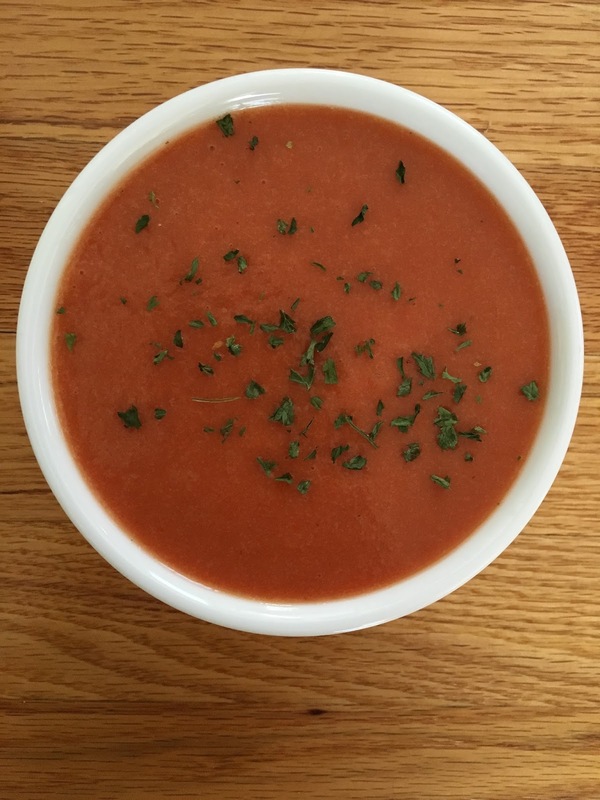 I served it with some steamed carrots and asparagus, fresh fruit, and homemade tomato basil soup. Delish! And super quick. I'm totally obsessed with wRAWps. They're gluten-free, vegan, nut-free, oil-free, sugar-free, AND 100% raw! They have tons of different flavors to choose from, perfect for whatever type of wrap you're craving! They even have pizza crusts, too! A big 'ol salad is ALWAYS a good idea, but ESPECIALLY on a "fast-food" night! Many times, I will make a big salad in the morning and leave it in the fridge so it's ready to go when I get home! And like wraps, salads don't require much thought, either: just use what you've got in your fridge...I have to say I've never eaten a gross salad! :) And in the winter, when you don't necessarily want a cold salad? I love doing WARM SALADS--simply steam or sauté all the veggies you would normally use raw! Steam spinach for your base, and add sautéed onions, tomatoes, bell peppers, and mushrooms. Add some canned chickpeas, fresh herbs, and a squeeze of lemon juice. Serve with cooked brown rice on the side. BOOM. So good. 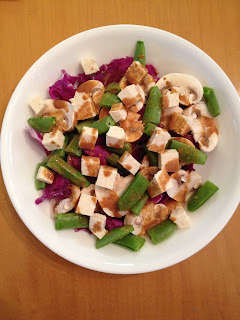 Easy Asian Salad with Peanut Ginger Dressing. 1. Combine all salad ingredients in a large bowl and toss to mix. 2. Combine peanut butter, ginger, soy sauce, water, stevia, and lime juice in a small ramekin and whisk until thoroughly mixed. 3. Drizzle dressing over salad and garnish with cilantro, if desired. Ooooooooh, who doesn't love a good old bagel?! Bagels are literally one of the most comforting foods on the planet, in my opinion. And they're such a great option for a quick evening meal: carbs are proven to help you sleep better, so they're great if you have to eat a late dinner! And they're super versatile: again, you can get totally creative with a bagel. Sweet or savory! 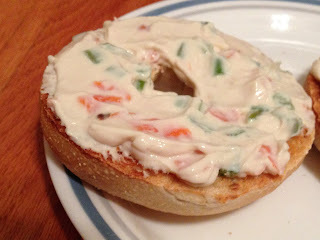 Toasted Gluten-free bagel with Homemade Veggie Cream Cheezeless. Ahhh, the casserole. Another one of those things you can literally throw everything into a giant mixing bowl, mash it up, bake, and hey--you've got a delicious dinner! Even better? You can cook them ahead of time, store in the fridge, and warm back up in the microwave/oven when you get home late. Whoever invented the casserole, I love them. Here's a fun little casserole I created the other night, sort of inspired by...A CHILI DOG. Yes, I'm serious. (The recipe is still vegan of course, and TOTALLY healthier than even a vegan chili dog!). 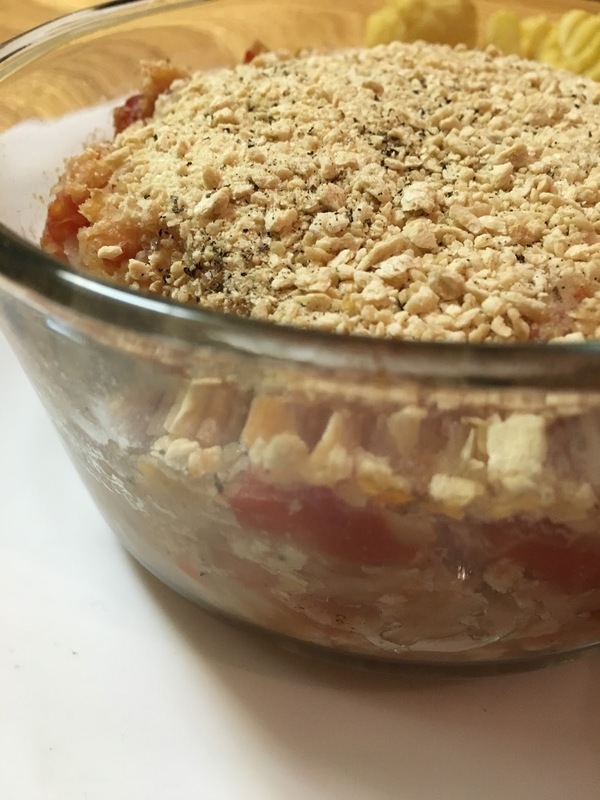 It combines loads of plant protein, gut-healthy probiotics from sauerkraut, tomatoes which pack a healthy dose of lycopene, and tons of flavor. I drizzled my casserole with my "Rockstar Ranch Dressing" for my cookbook, but get creative! Mustard would be delish too. 1. Combine TVP, spices, and salt in a medium-sized bowl and mix well. Add water and microwave 2 minute. 2. Add TVP, sauerkraut, and tomatoes to a large bowl and mix very well. Spoon into small casserole dish and sprinkle with breadcrumbs. Bake, uncovered, at 350 for 25 minutes. 3. Remove from oven, let cool 10 minutes, and drizzle with toppings of choice. Serve warm, with a side salad, homemade potato chips, and fresh fruit. Until next time, guys. Enjoy! Holiday Post! : Resurrection Cookies (HIGH PROTEIN!). When I was growing up, my mom would always make "resurrection cookies" every Easter. Not only were they delicious, but I have so many happy memories surrounding the whole process of making these. I remember it just like it was yesterday: standing in the kitchen with my mom and sister, with all 6 of our hands shaping these little cookies...and then eating them while watching movies! 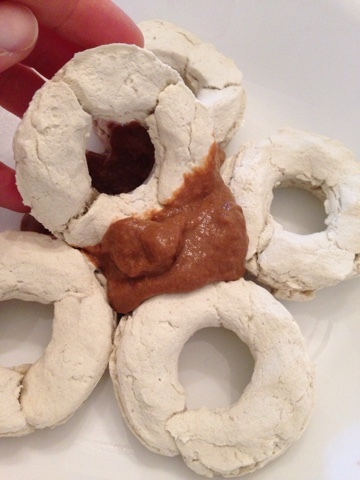 Protein Resurrection Cookies. Vegan, Gluten Free. Makes three large cookies. 1. Preheat oven to 350 F and line a baking sheet with parchment. 2. 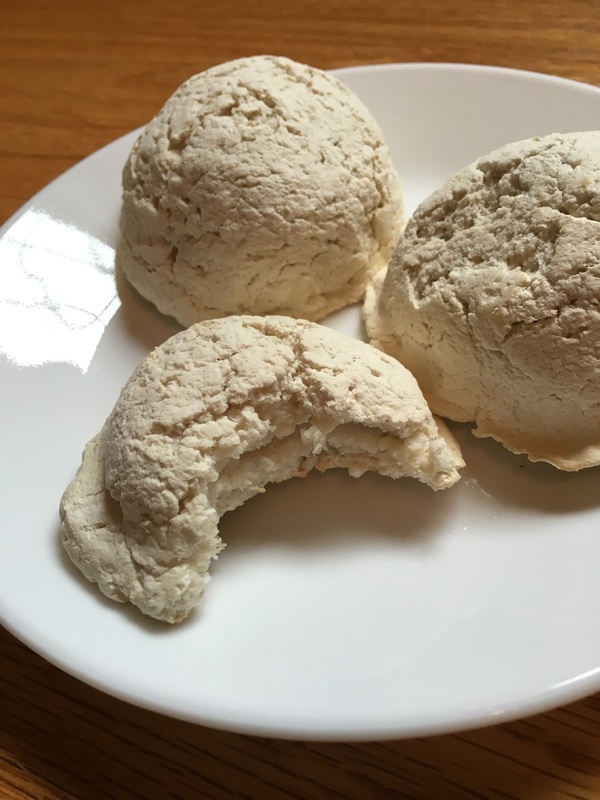 In a medium-sized bowl, mix flour, protein powder, stevia, and baking powder. Add water and mix to form a dough. 3. Divide dough into 6 sections. Take one section in hands, roll into a ball, and flatten into a circle. Place on parchment and repeat with remaining 5 sections. 4. Place one marshmallow in the center of one circle of dough. Top with another dough circle and gently press outer edges together to seal. Repeat for 3 large cookies. 5. Cover cookies with a foil tent and bake for 25-30 minutes, until firm and set. 6. Remove from oven and let cool 10 minutes before enjoying. Fitness Friday! : The Top 5 Fitness Trends...and if you SHOULD or SHOULDN'T be doing them! Hey, fitties! Happy Friday...or, as I prefer to call it, "FITNESS FRIDAY!" In today's post, I'll be analyzing the top 5 most popular fitness trends of late, and whether you should add these things to your fitness routine or not. Fitness watches have been up and coming for a while now, but with the release of the amazing new Apple Watch recently, the market for 24/7, portable fitness trackers has skyrocketed. But what's so great about these pricey little gadgets? And should YOU be wearing one? Tons of different brands and options, each with different features...meaning there's a watch for the total newbie, as well as the ironman triathlete. Price. Although you definitely get what you pay for, expect to spend upwards of $150 if you really want a good quality watch. Bulk. This one is only half true, I confess. There are definitely ski and trim watches out there, but let's be realistic--the bigger the watch, the more it can do. Can "lock you in". I would have to say the biggest downfall when it comes to fitness watches is many times, people lose the joy of their workout or run by obsessing over the stats during the run/workout. I remember a particular friend of mine who had just purchased her first fitness watch. 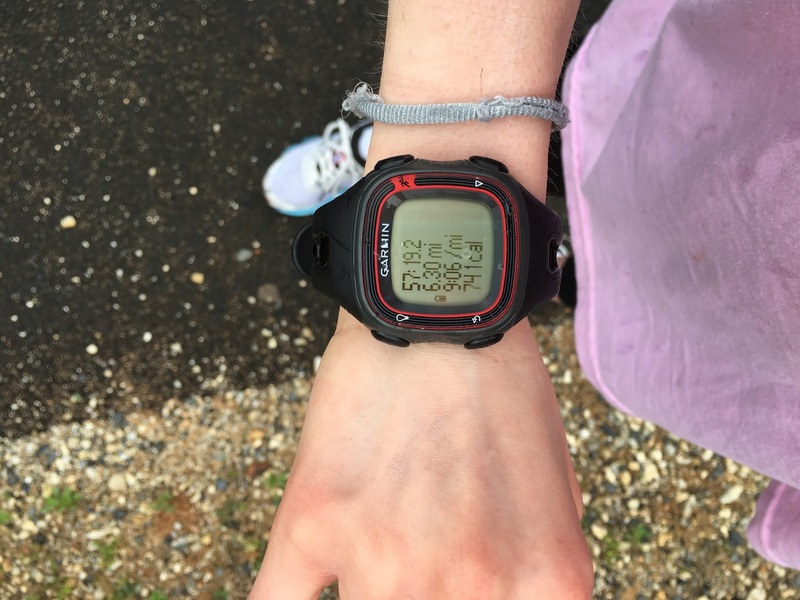 We went for a "fun run," but she was obsessing the whole time about falling behind her "ideal pace" and having her watch beep at her. Not fun. I really do love my Garmin. It's lasted very well (I'm going on 3 years with mine! ), and really helped me in my running goals. I avoid the "lock-in" to my watch by picking one run per week where I INTENTIONALLY leave my watch at home. This enables me to focus simply on the joy of my run, and prevents me from being so focused on distance, pace, etc. So my ultimate opinion on this trend? I say YAY! Minimalist shoes. I think you either love 'em or hate 'em. Here's the deets, peeps. They're ugly. This one is a matter of opinion, but I'm going with ugly. I love my 12 minute athlete app! So many apps...so little time! Impersonal training advice. While apps are great (no arguing there! ), nothing beats the one-on-one interaction with a real personal trainer. 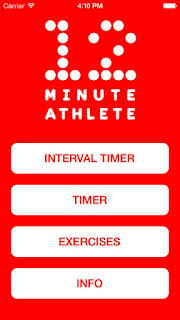 Apps can't answer your exercise questions or analyze your form! Sport-specific training is a relatively new trend to the fitness world. Basically what it is is exercise that is specially formulated for each individual athlete, based on what their primary sport or form of exercise is. So, if you're a rower, you would have a workout plan that is primarily focused on strengthening the muscles associated with rowing workouts. Doesn't prevent injury: by only focusing on the muscles that are already stronger than other muscles, athletes can start overcompensating for the less-srenthened muscles, ultimately leading to injury. Don't get me wrong, I love the idea of cross training for sport-specific athletes. However, this isn't really true cross-training. By only working out the muscle groups athletes are already working out, they almost totally defeat the purpose. The best exercise approach for a competitive/sport-specific athlete is a total body workout 2-3 times per week, in addition to their regular training. Head to the gym for a full-body lifting session, followed by 30 minutes on the bike/elliptical/treadmill, depending on your primary sport. HIIT me baby, one more time! Super quick workouts: the average HIIT workout is no more than about 15 minutes...TOPS! Super effective: By combining short bursts (about 30-50 second intervals) of insanely high intensity exercise and even shorter bursts of rest or low intensity exercise (10-30 seconds), HIIT literally makes you a calorie burning machine! 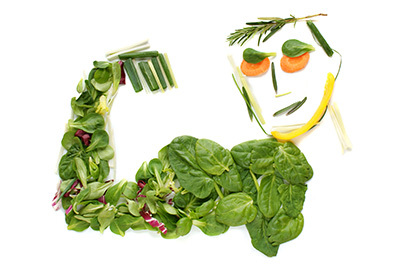 Your body doesn't have time to slow down, so you force your metabolism to catch up! Proven to shed fat while building lean muscle. I've always struggled with gaining muscle. But when I started HIIT training, BOOM BABY! HELLOOOOOO MUSCLES! Be prepared to work...HARD. Although these workouts are short, they are PAINFUL to put it lightly. 12 minutes of death, anyone?! Can be discouraging for a fitness/workout newbie. Because these workouts have SUPER short rest periods, someone new to the whole exercise thing can easily get discouraged. HIIT is no joke, people! It's hard! I love HIIT. Like, love affair love. But the majority of HIIT workouts available on the internet are geared towards those who have been exercising for some time, and developed fairly good cardiovascular endurance already. So what's the alternative for newbies? Simple. DEVELOP YOUR OWN HIIT ROUTINES. Seriously! It's super simple...I do it all the time, just for kicks! Simply pick your top 5 fave HIIT exercises (ones you've already mastered), followed by the longest work/shortest rest period combo you can manage (for example: my top 5 fave moves: burpees, rockstar jumps, slip jump lunges, dive bomber pushups, V-ups. My longest/shortest interval set: 50 sec. work: 10 sec. rest). After that, pick the length of your workout (I like 15 minutes, so with a 50:10 interval set, combined with my 5 moves, I would do this whole set 3 times). THAT'S IT! Not only is it perfect for your fitness level, but IT'S FUN! Gives you an opportunity to get creative! Still not sold on the whole "develop you own workout" thing? No problem. Shoot me an email at thefitveganginger@gmail.com and I'd be happy to help! Well there you have it, guys. The top 5 fitness trends of 2016. Now comes the fun part...deciding which ones you're gonna give a go! Anna, "The Fit Vegan Ginger"
EXTRA! EXTRA! : Be sure to keep your eyes out for my first recipe ebook, coming at the end of April! If you're anything like me, BBQ anything is good...but when it's hearty brown lentils and meaty mushrooms that are dredged in a sweet and tangy spicy BBQ sauce?! Well, "good" just turned into "glorious"! 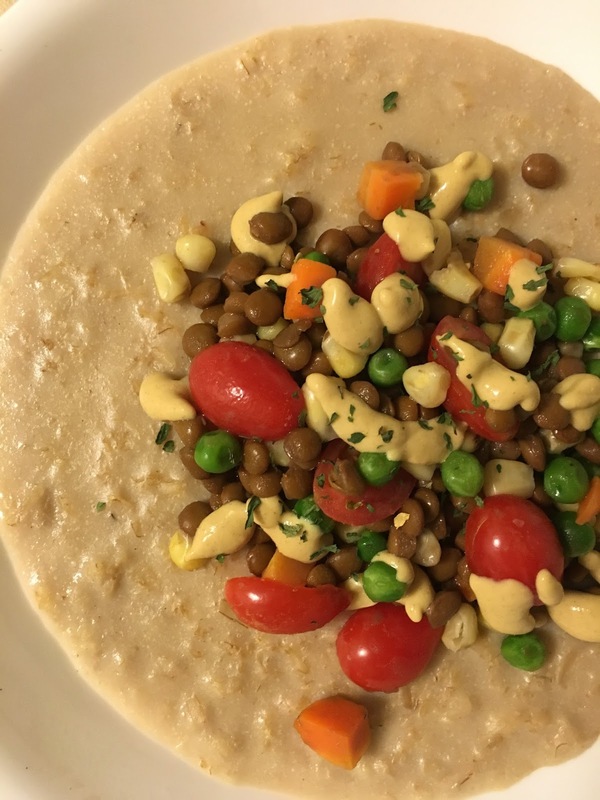 This is a super quick protein dish that is perfect to throw on top of a toasted hamburger bun, rice cakes, mixed greens, steamed veggies, or even brown rice or quinoa. Takes about 5 minutes, start to finish (no joke! ), and tastes as if you slaved in the kitchen for hours. Sounds to me like I just decided what you're having for lunch tomorrow (or midnight snack tonight, maybe?!). Enjoy, everyone! 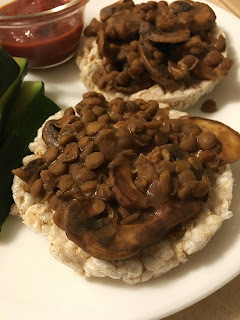 BBQ Lentils and 'Shrooms. Vegan, Gluten-free. Serves one. 1. Combine all ingredients in a small soup pot over medium-high heat and bring to a simmer. Cook, stirring constantly, until heated through and bubbling slightly. Serve as desired! New Workout Wednesday: Simple and Effective Upper Body Routine (Arms, Chest, Shoulders, and Back)! It's Wednesday...and you guys know what that means...A NEW WORKOUT! Specially formulated by yours truly :) This awesome routine focuses on Upper Body, i.e. arms (biceps and triceps), chest, shoulders, and back...all these muscles worked...in only about 30 minutes! Yep, you read that right: 30 minutes. How?! With TFVG secret workout formula: I call it "multi training." Basically, my simple formula combines two strength-based exercises into one, maximizing muscles used, while minimizing workout time. Additionally, by combining TWO exercises, you stress your body twice as hard, doubling calorie burn per exercise. This is a pretty basic, beginner-friendly workout, so not all the exercises are multi training exercises...however, as you get more comfortable with each individual exercise I introduce, you can start meshing more and more exercises together. Get creative with your training--exercise should be fun! Enjoy the workout! Warm up with 15 minutes light to moderate cardio before beginning any strength training routine. Always stretch after completing your workout. Nobody alive can deny the fact that breakfast is not only the most important meal of the day, but also the most delicious. I mean, come on--is there anything on earth better than a tall stack of perfectly fluffy flapjacks after a long day?! Nope. Nothing. One of the coolest things about breakfast is the diversity of dishes and flavor combos--you've got sweet, salty, warm, cold, comforting not, fresh, the list goes on and on. 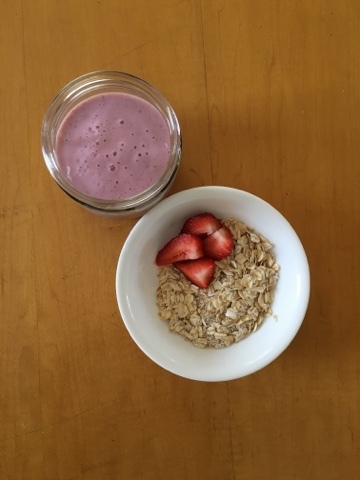 I'm generally a "sweet" or "fresh" brekkie eater: I can't go a day without my nice cream, oatmeal, and smoothies! But some days a girl just needs to eat breakfast twice...because there's just too many options!! And this, my friends, is my theory of how "breakfast for dinner" was born...along with this delicious recipe :) enjoy! 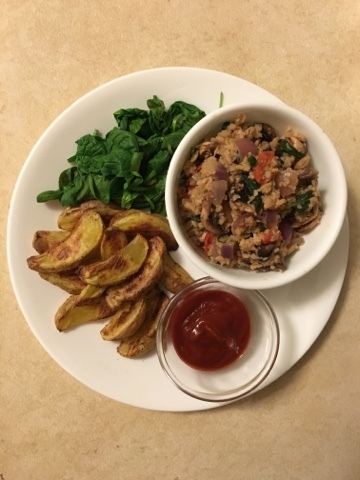 Savory Breakfast Bowl and Roasted Potatoes. Crisped to perfection...no oil needed! 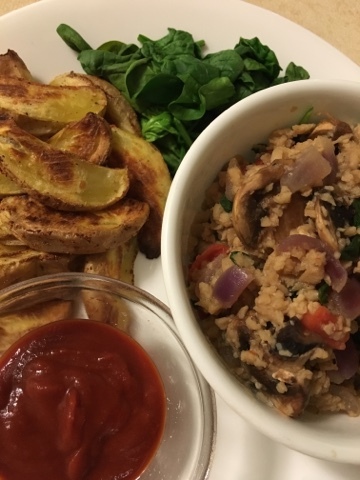 Vegan Sunday Brunch: Savory Breakfast Bowl with Roasted Potatoes. Vegan, gluten-free. Serves one. 1. Combine TVP and poultry seasoning in a medium microwaveable bowl and mix. Add 2/3 cup water and 1 T aminos and stir. Nuke 2 minutes. 2. Line a small soup pot with water and satire onion and garlic until soft and fragrant. Add mushrooms and cook 2 minutes. 3. Stir in cooked TVP "meat" along with tomatoes. Add a splash of water and stir. Cook over medium heat for 5 minutes. 4. Stir in chopped spinach off of heat until wilted. Season with pepper and spoon into serving dish. 1. 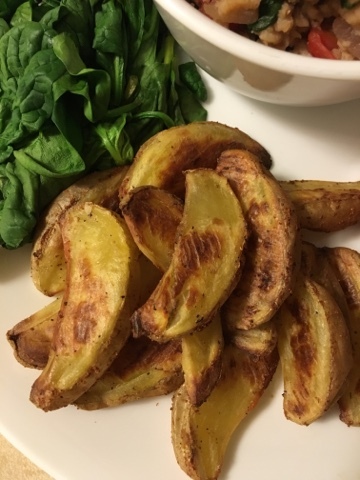 Place potato wedges into large bowl and drizzle with aminos. Sprinkle with spices and stir well to coat. 2. Spread coated potatoes over a parchment-lined baking sheet and roast at 400 degrees F for 25 minutes. 3. Remove from oven and let cool 10 minutes. Serve alongside breakfast bowl, with ketchup on the side, if desired. 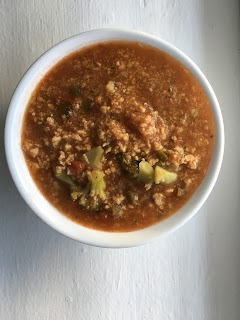 Super Simple Salsa Chili. Vegan, Gluten-free. Serves one. 1. Combine TVP and water in a medium-sized microwaveable bowl and nuke for 1 1/2 minutes. Remove from microwave and set aside. 2. Combine veggie broth, TVP, and broccoli in a small/medium-sized soup pot and bring to a boil. Reduce heat to a simmer and stir in salsa. Simmer 10-15 minutes for flavors to mingle. 3. Remove stew from heat and stir well. Pour into large bowl and serve hot, with crusty bread for dipping. My Favorite Weeknight Dinner: Savory Oatmeal! 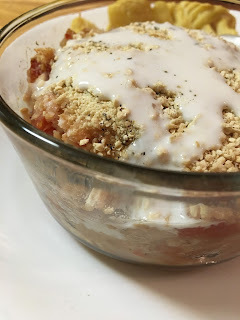 If you're one of those people who think oatmeal is strictly a breakfast food, prepare to have your world rocked....in a GOOD WAY! Savory oatmeal is the new thing, people. Seriously. 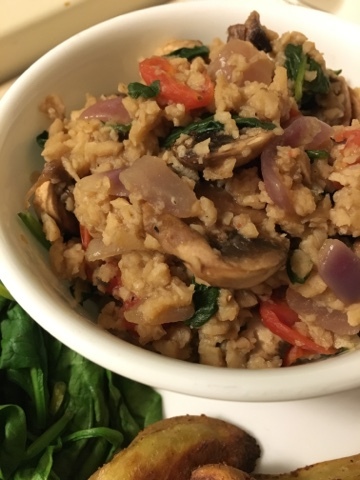 If you've never tried it before, this is a great recipe to start with--quick and simple and loaded with flavor and nutrition. Add a simple side salad and some fresh fruit and BOOM--"Dinn in 10"! Enjoy, guys! Roasted Garlic Savory Oatmeal. Vegan, Gluten-Free. Serves one. 1. Place milk in a small soup pot and bring to a boil over high heat. Reduce heat to medium and whisk in oats and spices OFF OF HEAT. 2. Return pot to heat and whisk well. Cook, stirring regularly, until thickened. 3. Pour into bowl and let sit 5 minutes. Top as desired and serve! I've seen lots of recipe bloggers who do a weekly "What I ate Wednesday" post on their blog, in which they literally devote that entire post to sharing everything that they ate on that particular day. I've always loved this idea--it's practically like a free meal plan from a health foodie, am I right?! However, as much as I love this idea and have thought about doing this type of post myself, I finally decided it was kind of pointless for me to do it...I mean, if you follow me on Instagram, you guys pretty much already know everything I eat ;) But, as I mentioned in a previous post not that long ago, I want to start transforming TFVG blog into more than just healthy recipes--I want to start posting about ALL the things I'm interested in, and interested in sharing with you all...start making TFVG a vegan health and fitness blog, instead of just a vegan recipe blog. With that said, it's been really fun thinking up a new topic to post on each week--be it a new workout, a discussion question, general health and fitness tips, you name it. When this week started, I knew EXACTLY what I wanted to post on for (one of) my non-recipe posts...ALL OF MY FAVORITE PRODUCTS as of late! I'm definitely a vegan health food product connoisseur--no question about it. 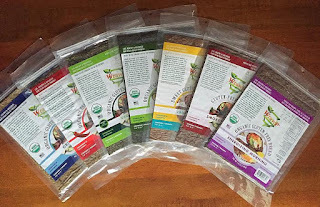 I love spending hours perusing new health food stores, gourmet food shops, even local grocers that just so happen to have an outstanding organic or natural food section. Some of my all-time favorite products were an "accidental discovery," so to speak--I just ran into them in the most unlikely of places! 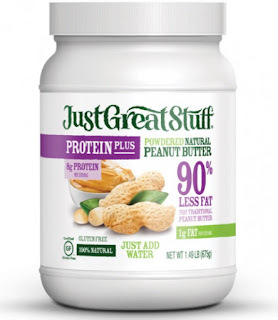 I love, love, LOVE finding new yummy products to enjoy--but you know what they say...half the fun of doing something (or in this case, FINDING something!) is sharing it with someone else! And my foodie finds are no exception! I am completely and totally 100% unashamedly OBSESSED with these wraps. THEY. ARE. UN. BELIEVABLE! 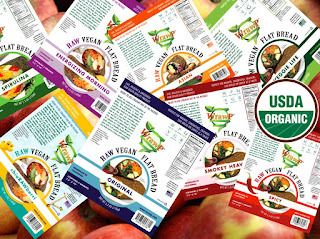 All wRAWp's products are certified organic, gluten-free, vegan, low-fat, grain-free, paleo, and nut-free! Not to mention darn delicious. 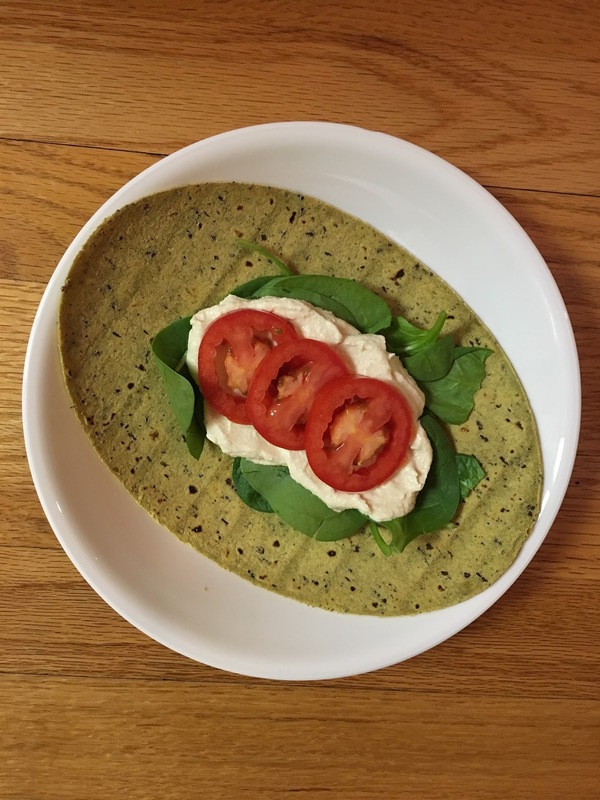 And while most gluten-free tortilla and wrap options tend to be stiff and crack easily, wRAWps are super soft and pliable--the perfect vehicle for an over-stuffed burrito :) You can find wRAWps on the website, at www.wrap.com, in addition to on Amazon, and in various chain grocery stores. 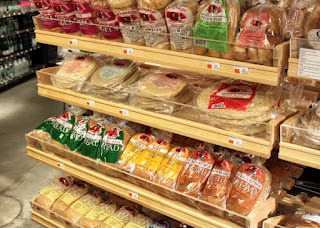 My love of Sami's Bakery Breads is nothing new--but it's too strong not to mention anyway! This is literally the most delicious bread I've ever had in my whole entire life...gluten-free or non! This bread is literally a dream come true: gluten-free*, oil-free, sugar-free, preservative-free, and NOT FROZEN! Yup, I repeat--NOT FROZEN PEOPLE! Amazingness. Thought you had to kiss your light-as-a-cloud PB & J sammy's goodbye?! Not with Sami's--pun intended. (see what I did there? I know. I'm so clever.) Sami's products are available on their website, www.samisbakery.com, and in countless locations in the southeast (the actual bakery is in Tampa, FL!). *While many of Sami's products do not contain wheat or any gluten-containing ingredients, none of Sami's products are certified gluten-free. However, I have a gluten-intolerance (non-celiac) and am not bothered at all by Sami's non-gluten products. However, if you are highly sensitive to gluten or have celiac's disease, be advised that Sami's products are NOT certified gluten-free and ARE processed in a facility that produces wheat and gluten-containing products. 4. Zevia Stevia Sweetened "Soda"
I just recently discovered Zevia soda--and immediately fell in love! As someone who was already obsessed with seltzer water, Zevia is a nice option for those times when seltzer just won't cut it...like with a giant bowl of nooch-covered, oil-free popcorn and the latest Grey's Anatomy episode! :) Zevias are all-natural, sugar-free, calorie-free, and artificial sweetener free (sweetened with STEVIA and ERYTHRITOL--both of which are 100% natural plant-based sweeteners! ), with TONS of yummy, fizzy flavors (my favorite is the Ginger Root Beer! So good!). Zevia soda can be found at any grocery store with a natural food section (ACME, Food Lion, Kroger, Whole Foods, some ShopRite locations, etc. ), and on lots of online retailers (www.zevia.com, Amazon, even Walmart.com!). 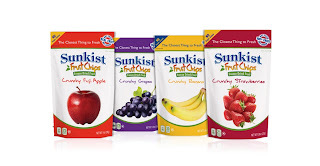 Sunkist Freeze-Dried Fruit varieties are a super fun snack and a nice change from dried fruit. I love adding these crunchy goodies on top of my oatmeal, in cereal, in homemade "trail mix," or even straight outta the bag by the handful! And with four different fruits, the possibilities and combo ideas are endless (the grapes are my fave! YUM!). 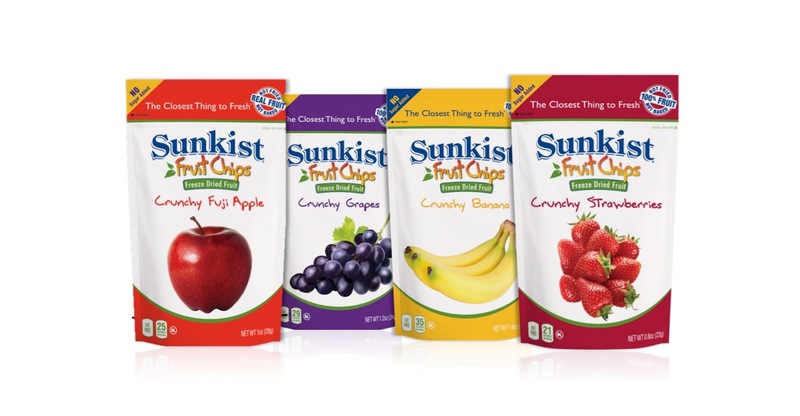 You can usually find these in Walmart, in addition to on the Sunkist company website. You need these in your life. These Protein Donuts are gluten free, oil free, sugar free, and super high protein (obviously, according to the name, haha), and delicious. All you need is about 35 minutes in the kitchen TOTAL to make them even more impressive! 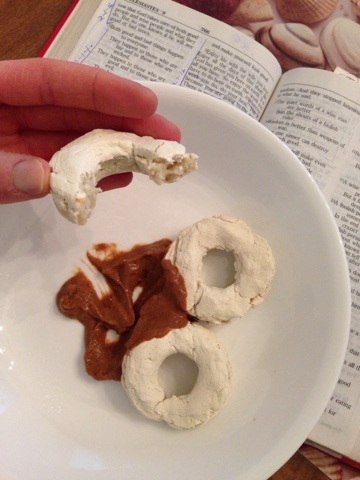 Add a little peanut butter for dipping goodness, and these little guys become a perfect combo of protein and carbs-the ultimate post workout snack! Enjoy! 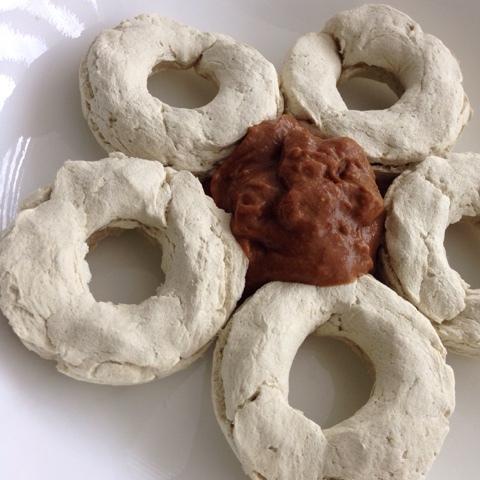 Gluten Free Protein Cake Donut. Vegan, Gluten-free. Serves one. 1. Combine flour, protein powder, stevia, and baking powder in a medium sized bowl and mix well. 2. Add water, stirring in as you go to avoid clumping. 350 for 25-30 minutes, until firm. 4. Let cool 10 minutes before removing. 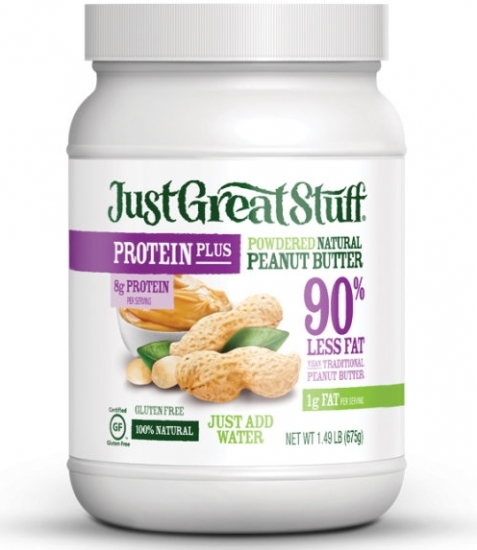 Serve with PB!